We are Cha-Long Muay Thai or Suwit Muay Thai . Because Suwit gym is at Chalong area. Martial arts as well as combat sports have become a real hit among people all over the world. They use them for sports training, leisure and meditation. Muay Thai is a combination of both activities which make this fitness activity even better. Muay Thai has emerged some 6 centuries ago. This combat skill is based on the kicking, elbowing, punching and attacking opponents with the help of the following eight limbs – elbows, fists, knees and legs. The main reason why experts advise Muay Thai enthusiasts to travel to Thailand is the fact that this sport originates from this Southeast Asian country. Of course, Muay Thai became popular 6 centuries ago and it is still the most popular sport in Thailand. You cannot compare training Muay Thai in your local gym with Muay Thai training in a camp in Thailand where all the customs and authentic Muay Thai movements are preserved. 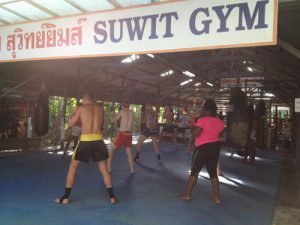 So, if you want to do something useful for your health, travel to Thailand and join a reputable Muay Thai training camp as Chalong Muay Thai there. Suwit Muay Thai is a camp that is located in the southern part of Phuket Island. This camp has been serving Muay Thai students from every part of the world for more than two decades. Many women were part of the training classes too and some of them have become regular guests in this camp. Chalong Muay Thai and basic detail : Suwit Muay Thai is offering special loss weight programs for people who have limited time to do something good for their health. Of course, they also have programs for those who want to become stronger or for those who are prepared to learn how to defend themselves. Chalong Muay Thai at the good location : The beautiful atmosphere, the professional instructors, the modern equipment and clean premises will help you forget about your everyday life. Once you are done with the challenging Muay Thai training classes you can enjoy on the beach located close to Suwit Muay Thai and explore the island. Chalong Muay Thai for beginner level : This is a truly useful type of holiday that can help you with your mental and physical health. Chalong Muay Thai camp : That being said, once you don your Muay Thai gloves, things may not seem as easy as you have made them out to be initially. You will have to work hard – it’s in the nature of the world of martial arts. We can’t really imagine you becoming a proficient martial artist unless you work hard at it for a long period of time. Chalong Muay Thai for healthy life : You will manage to lose weight and improve your health. And this is what you were after all along – this much is clear. Chalong Muay Thai with regular course : The movements and strikes you can learn on these classes will help you improve your overall health. Chalong Muay Thai for professional athlete : Muay Thai is known as immune booster because it supports the metabolism. The work of your metabolism will be accelerated and the effects will last for hours. Chalong Muay Thai at great center : You will also notice that your muscles are slowly getting toned. All these things will make you feel better and happier and remove any traces of depression or stress. Muay Thai Camp in Thailand or Chalong Muay Thai in Thailand : Phuket is the richest island in Thailand and the most valued travel destination in this region. Each part of Phuket Island is different and worth visiting. This island offers countless opportunities for people, who enjoy water sports, but those interested in improving their health and fitness level should know that Phuket has another highly-efficient type of training in its offer . Muay Thai Training in Thailand is good for you: In order to stay safe and figure out which type of training is the best for you, you can use the help of the experienced coaches who work with Muay Thai for years. They are all former or even actual fighters and you can always learn something new from them even if you are a pro.